Have you ever had the thought, or commented on, how much our childhoods as Baby Boomers were more cheerful and light-hearted and full of joyous memories? We were entertained by seemingly harmless and innocent TV shows and movies -- things like I Love Lucy, Leave It To Beaver, Charlie Brown, Andy Griffith, Rocky and Bullwinkle, and who can forget gathering the family around the TV for Walt Disney on Sunday nights? We've all seen what the Disney studios have created in Miley Cyrus, and we tend to think that modern-day Disney no longer resembles the Disney of our youth. That Disney is seen in our memories as harmless and nontoxic; definitely not dangerous or evil. But let me share something with you that just may show how faulty that reasoning is. I recently discovered that Disney is planning a live-action adaptation from a segment of their 1940 animation masterpiece, Fantasia. You may recall the recent movie Maleficent, starring Angelina Jolie as the iconic witch from the Sleeping Beauty animated film, known as "The Mistress of All Evil". 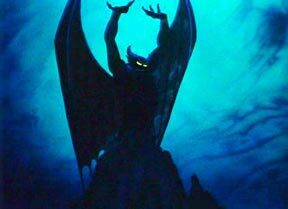 Now, Disney is planning a 2016 release of the Fantasia segment titled "A Night On Bald Mountain", which Hollywood Reporter characterizes as a live-action film "centered on a dark winged creature who raised spirits from the dead. They dance, fly through the air and enjoy a night of mayhem until they fade away as the night ends and the sun begins to rise." I'm sorry, but that is far too demure of a portrayal of this film. (Click on the above link to see the Fantasia segment). When the original animated version of Fantasia hit theaters in 1940-41, this segment openly glorified Chernabog, a giant evil demon, who appears as the only main character in the "Night on Bald Mountain/Ave Maria" segment. He has been praised as Disney's best representation of pure evil, and as animator Vladimir Tytla's greatest triumph. As a very "raw" representation of evil, he, in his original appearance, is not placed in the context of any real story, and he and his minions' actions are not committed in pursuit of any discernible goal other than general havoc–wreaking and tyranny on all... in other words, "to steal, kill, and destroy" (John 10:10). Chernabog is one of the most powerful villains Walt Disney has ever created because he is depicted as a ruthless monster, feared by all who encounter him. Walt Disney, himself, said another name for Chernabog was Satan. Many of his appearances also show him to be somewhat comedic, as seen in The Wonderful World of Disney, and House of Mouse. But I promise you, he is anything but funny. His power is shown to be incredibly demonic, being able to unleash hellish realms and spirits. While immensely dark, he has managed to become a trademark Disney villain. The reason that I am alerting you to the existence of this character and want you to focus on his re-emergence in this new animated film, is because I believe that there is real demonic power and forces behind such creations as this. 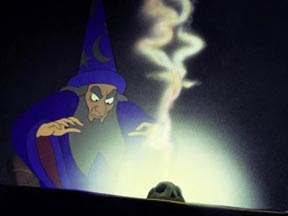 In fact, Thornton Hee, another Disney animator who worked on Fantasia, recalled wanting to ask Vladimir Tytla (the creator of the character Chernabog) about something, but when he entered the animator's room, he found it was in complete darkness save for the fluorescent light under Tytla's drawing, which lit his face in an eerie way as he worked. This unnerved Hee enough to compel him to leave without alerting Tytla to his presence at all. And Thornton Hee was not the only one frightened by this depiction of Chernabog. At the time of its release in 1940, many parents criticized the film for frightening their children in the "Night on Bald Mountain" segment. One film critic, Dorothy Thompson of The New York Herald Tribune, wrote that she "left the theater in a condition bordering on nervous breakdown," because the film was a "remarkable nightmare." And no wonder... when you read of Chernabog's descriptions on a website dedicated to his creation as an animated character, you read things like "Gigantic, slender, muscular, scary-looking face, black skin and horns, yellow glowing eyes, jagged fangs, giant black wings with purple undersides". You read that his "occupation" is Demon Lord. The things he likes are "Evil, darkness, war, chaos, night, fire, shadows, sins, hate, fear, despair, death". And he dislikes "all that is good, and the light". • The words in his name, "cherna" and "bog", mean "black" and "god" in Slavic languages (his animator, Vladimir Tytla was Ukrainian). • Chernabog was referred to as "Yen Sid" in the pencil tests for Fantasia. But "Yen Sid" was used as the name of Mickey's magic master in The Sorcerer's Apprentice scene in the film, and the animation of both characters were supervised by Tytla. (Further evidence that Disney knew exactly what was being created in this film). • Chernabog is unusual in that he has no other purpose other than to be evil. He is not interested in conquest. (Remember: "Steal, kill, and destroy" -- he knows he can't win). • Walt Disney called Chernabog the devil himself. My point in recounting all this information is this: I do not believe that the inclusion of Chernabog in the original animated film, nor his appearances in the current Kingdom of Hearts video game series, or his new starring role in the forthcoming live-action film adaptation, is a coincidence. It is my conjecture that people influenced by the demonic presence of Satan on this earth know exactly what they are doing. It is no coincidence that several people I know have expressed harassment by a "dark entity", sometime in their life, that just happens to resemble this animated character. So what do you think is the purpose of re-introducing Chernabog to a new generation? Could it be the same as Maleficient? (See my thoughts on this film at this blog post). I firmly believe that children who are subjected to horror movies or TV shows -- everything from Fantasia, to Dark Shadows, to The Shining, to Halloween and Freddie Krueger, to the Twilight series -- are being not only influenced by the demonic realm, but are being subtly persuaded, if you will, to accept this as normal and nothing to fear -- sort of a "soft sell" approach to accepting the reality of Evil. Except that there is nothing "soft" or "subtle" about Satan and his demons. And, for what it's worth, even as an adult, to watch "A Night On Bald Mountain" is deeply disturbing to my spirit. Guard your children! Walt Disney and his funny little mouse buddy are not your friends! Ephesians 5:11 "Take no part in the unfruitful works of darkness, but instead expose them." So true, my grandbabies where here this weekend and I thought we could watch Casper together. Remember "Casper the Friendly Ghost"? It is not our old Casper and he even looks different. There are zombies and I don't know what all, because I didn't allow them to watch it very long at all before I realized that it was totally different than when we were little.